The Bankshot Sports™ Organization offers many different family sports, which are non-aggressive by design, including: Bankshot Basketball™, Bankshot Tennis™, Bankshot Pitch and Throw™, and Bankshot Soccer™. A step-by-step guide for your Bankshot™ System. 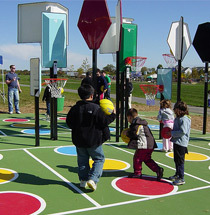 A Bankshot™ course consists of a varying number of stations. Click on one of the locations and find a Bankshot Sports™ representative near you. "We played at the Bankshot™ today. All the children had a great time - not just the 'sporty' ones! The teachers were commenting how good it was Thanks!!" The fact that Rabbi Dr. Reeve R. Brenner served as the Jewish chaplain of the National Institutes of Health, in no way suggests an endorsement by the NIH of the information or materials on this website. Dr. Brenner's poetry, articles and books are not associated with the NIH nor are they approved or disapproved, Chicago Bulls Jersey, endorsed or supported by the NIH in any way. Copyright © 2011- BANKSHOT™. All rights reserved.